The Institute for Astronomy's Prof. Catherine Heymans has been awarded the 2017 George Darwin Lectureship by the Royal Astronomical Society. The Lecture is given annually, on a topic in astronomy, cosmology or astroparticle physics. 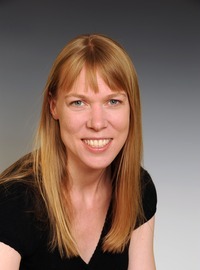 Professor Catherine Heymans is a world-leading observational cosmologist who is well known for her innovative and ground-breaking work in the field of weak gravitational lensing. In recognition, she holds a Personal Chair at the University of Edinburgh. She is the principal investigator for two successive major research grants from the European Research Council that support her team’s research on the Dark Universe and Beyond Einstein Gravity Theories. Since completing her PhD in 2004, Prof. Heymans has co-authored over 100 well-cited articles in peer-reviewed journals. She is a founding member of the Young Academy of Scotland. Professor Heymans is devoted to promoting the public’s understanding of her research. She has appeared in a wide range of events, at numerous Science Festivals, and has written a number of articles for the popular Institute of Physics science magazine 'Physics World'. Her TEDx talk on the Dark Side of the Universe has had over 8000 views on YouTube showing that she is an accomplished public speaker. For these reasons, Professor Heymans is awarded the George Darwin Lecture. Institute for Astronomy, The University of Edinburgh. This article was published on Jan 16, 2017 .